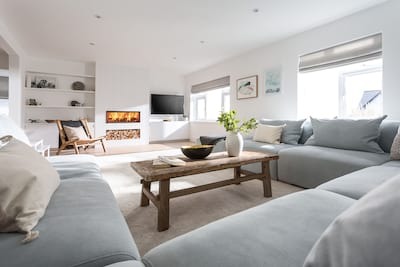 With its plum location within the coastal village of Trevone, North Cornwall, St Helen’s House offers an unrivalled base for beach holidays, action packed weekends and celebrations. 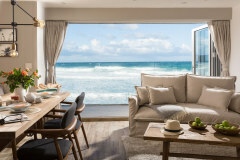 4 stylish bedrooms offer luxury accommodation for up to 8 guests whilst the generous living, dining and kitchen spaces ensure the perfect holiday layout in all seasons. 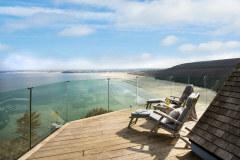 Discover the nearby harbour town of Padstow, the plethora of golden sand beaches including Trevone just minutes from your holiday door, and the cool coastal way of Cornish life. Private parking for 2-3 cars. Welcomes up to 2 dogs. Upon arrival this majestic cedar clad home sets the stylish scene for a memorable holiday. A striking welcome awaits within the hallway with vibrant Moroccan inspired floor tiles offering a nod to the owners unique design flair and creative décor found throughout St Helen’s House. Lead into a large open plan kitchen and dining space filled with natural light from the terrace glass doors and views beyond to the rolling fields. This wonderful use of space is certainly the hub to your holiday as family gather around the island unit and get stuck in with the cooking prep or simply offer pre-dinner chit chat as you enjoy the luxury of this modern fully fitted kitchen. The large dining table will easily seat up to 8 guests and is perfectly placed for children’s early suppers or milestone celebrations perhaps. The comfortable sofa and wall mounted TV add flexibility within the home and a superb break out space for children away from the formal conversation of the living room. The living room oozes style with considered artwork, oversized armchairs and comfortable sofas. Kick into relaxation mode at the end of the day or cosy up around the wood burner in the cooler months. A practically perfect utility area and ground floor cloakroom completes the ground floor. 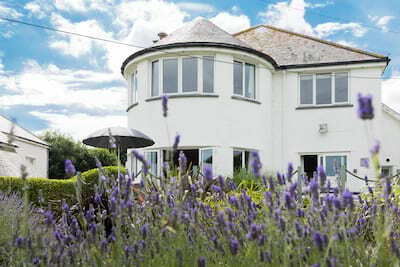 A central staircase leads to the first floor with 3 bedrooms and contemporary family bathroom, again these wonderful rooms are flooded with natural light and offer ever-changing views be it the green fields or down towards the sea. Climb the final stairs to The Loft Room set in the eaves of the house, an indulgent haven with Juliet balcony, private dressing room and chic ensuite bathroom. The owners attention to detail is flawless ensuring St Helen’s House remains flexible for all group types yet does not compromise on luxury. From the kitchen and dining space, throw back the double doors and step out onto a wonderful slate terrace to the rear of the house. Capture the day long sunshine and enjoy peaceful days in the garden. Steps lead down to a lush green lawn offering a safe and enclosed space for children and dogs to play. To the front is smaller bistro table and 4 chairs just perfect for a morning coffee as the day unfolds. 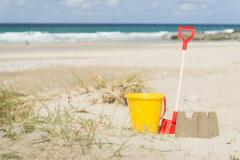 Leave the car behind and pack up for the beach within a 5 minute walk away. 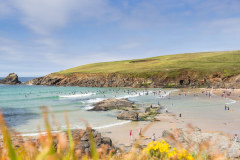 Trevone is tucked under the beautiful Trevone Headland and offers crystal clear swimming waters, a sandy beach, cool surf shop and beachside café. 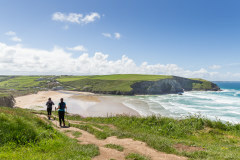 Just around the point is a smaller beach known locally as ‘Rocky Beach’ and beyond the South West coastal path hugs the coastline heading North towards Padstow or South towards Constantine and Treyarnon Bay. 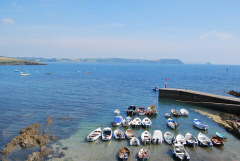 St Helen's House is only 1.5 miles from Padstow old town across the footpath from behind out house. If beach days are on the agenda then there really is no better location. The characterful harbour town of Padstow is just 10 minute drive away and offers some truly impressive places to dine including Paul Ainsworth’s No 6, Rick Stein’s Seafood Restaurant and of course the family favourite of fish and chips on the quay. 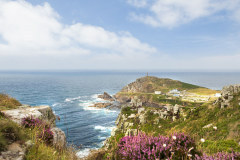 Cornwall’s natural playground is on your doorstep and invites you to hit the waves, try deep sea fishing, coastal hiking, Windsurfing, Water skiing or simply embracing the Cornish elements with a beach stroll. 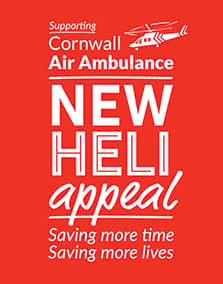 St Helen’s House is no ordinary holiday home and ticks the boxes for a spacious luxury house within a very beautiful corner of Cornwall. St Helens House welcomes up to 2 dogs. The sandy side of Trevone Beach operates a seasonal dog restriction but the rocky beach is dog friendly year round. 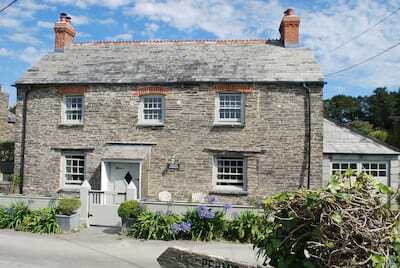 The house is only 1.5 miles from Padstow old town across the footpath from behind out house. The property changeovers, welcome gift and maintenance are managed by the property owner. 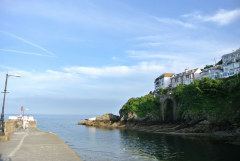 Fabulous house in a great location. Would definitely come again. Amazing house in a great location.